I've been craving Spring for quite some time now and this salad brings it a little bit closer. I could eat broccoli like there's no tomorrow. A vegan who devours broccoli - such a cliche, I know. But it's so freakin good! Once I came from a long run and just wanted to eat a load of broccoli. So I simmered it in some tomato juice and ate it on a bread. Absolutelty satisfying. I love to simmer the broccoli with a little bit of liquid, so it will be more tender and not that super crunchy anymore. I also wanted to add capers to this salad. 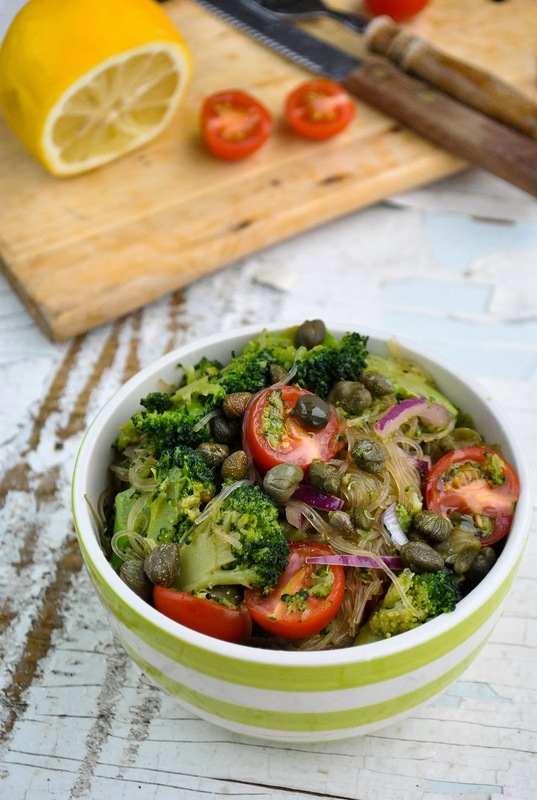 For me, capers are like tiny little olives packed with a nice and salty taste. 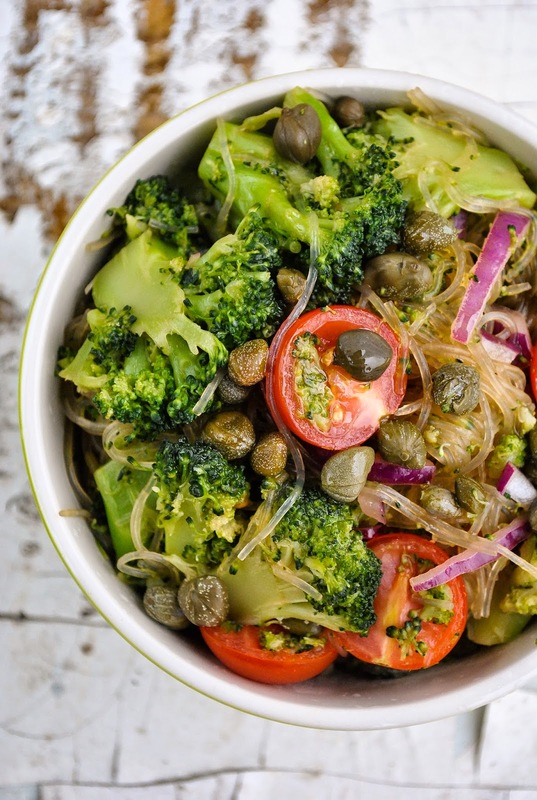 They suited perfectly with juicy broccoli, rice noodles, sweet cherry tomatoes and red onion. And if you are lucky, you have some lemon infused olive oil at home. I did and I put it on everywhere, including this salad. First, my friend Anna had this oil at her home and when I tasted it, I knew I have to have it too. Now I always have a bottle on my kitchen self (thanks, mom!) and I pour it even onto my morning buckwheat flake porridge. But a regular olive oil would suit really great too! Pour the water into a medium pot and heat it up. Add sliced broccoli florets (remove the stems). Cover the pot with a lid and let the broccoli simmer for about 5 minutes. In the meantime, pour some boiling water over the rice noodles and let them soften for about 3-4 minutes. Drain and rinse with cold water. Tear the rice noodles into smaller chunks. Add the rice noodles to the broccoli along with the other ingredients. Mix carefully with your clean hands. Serve.